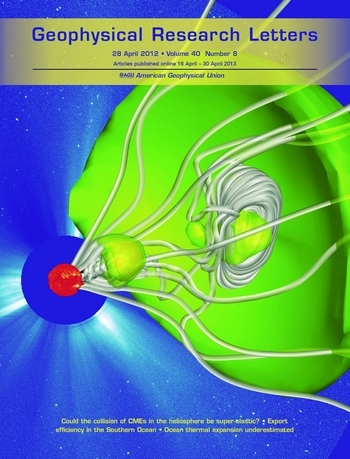 Could the Collision of CMEs in the Heliosphere be Super-elastic? Recently, space science scientists from National Space Science Center (NSSC) and University of Science and Technology in China (USTC) analyzed the energy transformation between two Coronal Mass Ejections (CMEs) after their collision based on three-dimensional (3D) numerical simulation. It is the first time such endeavor has ever been made. Though CMEs are magnetized fully ionized gases, a recent observational study of a 2008 November CME collision event suggested that their behaviors in the heliosphere resemble that of elastic balls, and their collision is probably super-elastic. Yet, still its validity is doubtable, as the result was obtained based on the remote imaging data from STEREO spacecraft and highly ideal assumptions. "A numerical simulation may favor us validating the possibility of CMEs’ super-elastic collision”, said SHEN Fang, Prof. at State Key Laboratory of Space Weather. 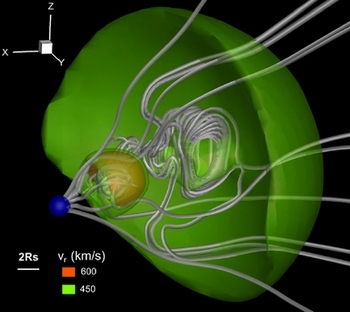 The research group including Prof. SHEN Fang and Prof. FENG Xueshang from State Key Laboratory of Space Weather, NSSC, therefore conducted 3D magnetohydrodynamic simulations based on an observed collision of two CMEs in 2008. Comparing a simulated inelastic collision with a simulated super-elastic collision, they found out that the super-elastic collision matches more closely with the observations and the kinetic energy gained in the collision was about 3-4%. The study demonstrated that CME collisions can be super-elastic. Figure 1 shows the 3D view of the radial velocity distribution at the beginning of the collision. Partial regions with radial velocity equal to 450 and 600 km/s are displayed for clarity. The CMEs can be recognized through the superimposed node-shaped magnetic field lines. The research entitled Could the collision of CMEs in the heliosphere be super-elastic? Validation through three-dimensional simulations was published as cover article on Geophysical Research Letters (GRL) (Volume 40, Issue 8), doi:10.1002/grl.50336, 2013. It was also chosen as one of American Geophysical Union (AGU)’s “Research Spotlights" published on the back page of Eos, AGU's weekly newspaper.